Architectural elements combine in this handsome hall console. A breakfront design, fluted pilasters and framed door panels lend traditional character. 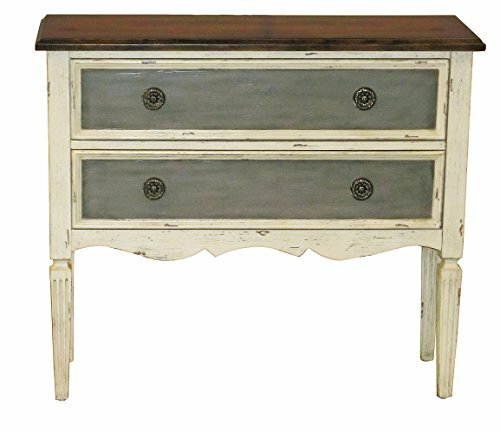 Rub-through distressed finish accentuates the moldings. One large adjustable shelf behind the two center doors and one adjustable shelf behind each end door, allow for storage.Home Meridian International warrants this furniture to be free from material manufacturing defects for one year from the date of purchase. Under this Warranty, the sole liability of Home Meridian International is limited to repair parts. This Limited warranty provides coverage solely to the original retail purchaser and does not apply to rented, business, commercial, institutional, or other non-residential uses. All warranties, whether express or implied, cover only normal household usage. No warranty, express or implied, applies to any condition resulting from misuse, abuse, delivery or transportation damage, nor -any condition resulting from incorrect or inadequate maintenance, cleaning or care. Dated proof of purchase is required for all warranty claims. The Maris hall chest features a distressed light finish with contrasting dark drawer fronts and cherry finished top for an overall relaxed-traditional appearance. The storage capacity and wide shallow shape of this chest make it useful in any number of rooms. 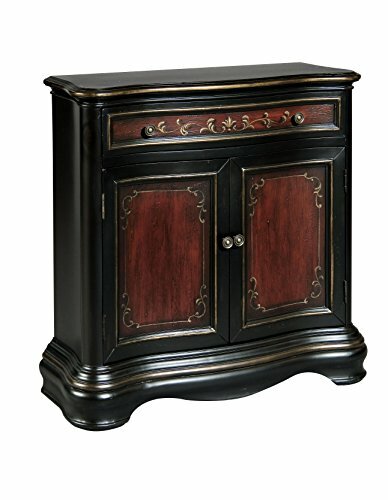 This curved cabinet is built in our rich brown Gem finish with large faux metal panels on the drawer and door fronts. An incised bun foot and antiqued nickel hardware complete the traditional style. The shallow depth of our chest allows it to be put into service in most any small room or hallway. 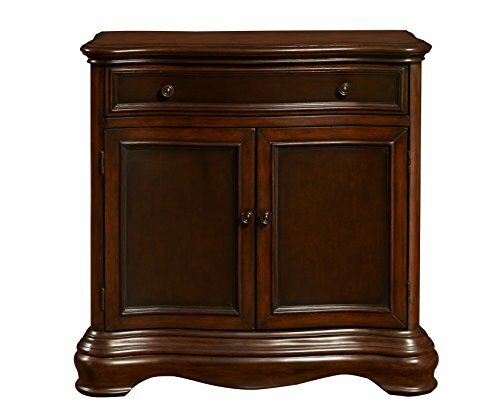 This style is classic traditional with a curved front, stepped moldings, inset panels and rich dark brown finish. There is one drawer. Inside the two doors is an adjustable shelf. 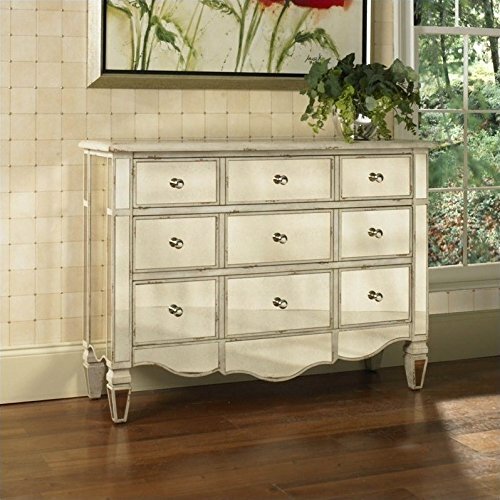 Classic forms combine with an updated finishes combine in this hall chest. Glossy black painted finish, silver leaf trim. And faux croc skin panels add up to chic glamour. The interior provides a pop of red and convenient storage. Our serpentine shaped chest appears beautifully aged. The black Essex finish is enlivened with deep cherry toned panels, gilt tale painting, and soft gilt highlights on stepped moldings. 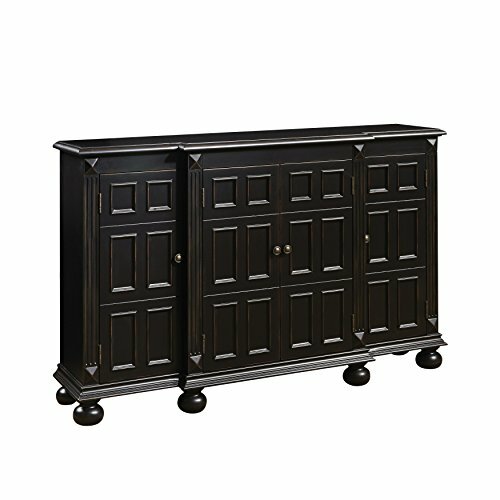 This chest is solid, tall, and compact - perfect for an entry hall with limited space. One drawer and one door with adjustable shelf behind provide storage. Modern styling, a metallic finish and all those mirrors, mirrors, mirrors make this console table with tall tapered legs a standout. Crystalline knobs on the three drawers amp up the glamour. This four drawer accent chest in a terra cotta tone showcases an aged finish at its top and base, with layers of gold, silver and terra cotta. Ring pulls on the drawers feature leaf motif back plates in aged metal. The interior of the drawers is finished in dove gray. Our chest of drawers is wildly glamorous, but in a polished classic way. 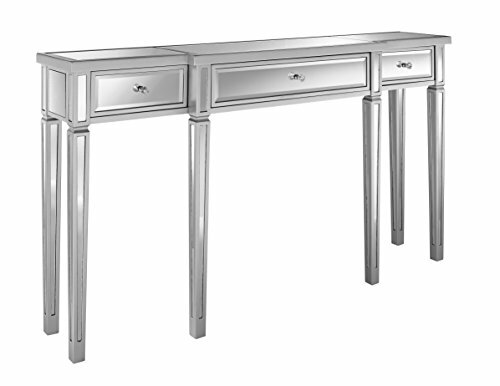 This French furniture form is built in our Radiance finish, with a silvery rubbed body color and mirror drawer fronts. Petite chrome finish drawer pulls keep everything glowing. There are three wide drawers with accent moldings. 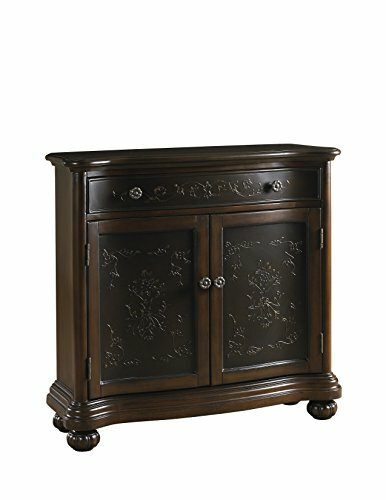 You can count on solid construction and durability in this chest. As instant architecture for a bare wall, this hall chest excels. 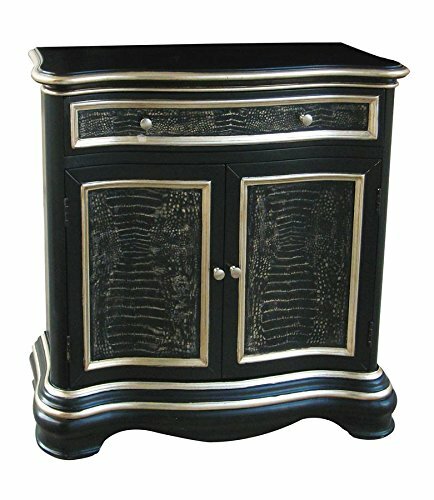 Southern traditional is evidenced in the scrolling flourishes, cabriole foot and our dark Tara finish. There are two drawers, two doors and a shelf behind each door. The slim silhouette takes up very little walking room while providing lots of style and storage. Compare prices on Pulaski Hall at ShopPlanetUp.com – use promo codes and coupons for best offers and deals. We work hard to get you amazing deals and collect all available offers online and represent it in one place for the customers. Now our visitors can leverage benefits of big brands and heavy discounts available for that day and for famous brands.